Joseph's Robiquetia is a rare and threatened orchid growing on trees, up to 8 cm tall. Leaves are 4-7 x 0.3 cm, linear, grooved, blunt at tip. 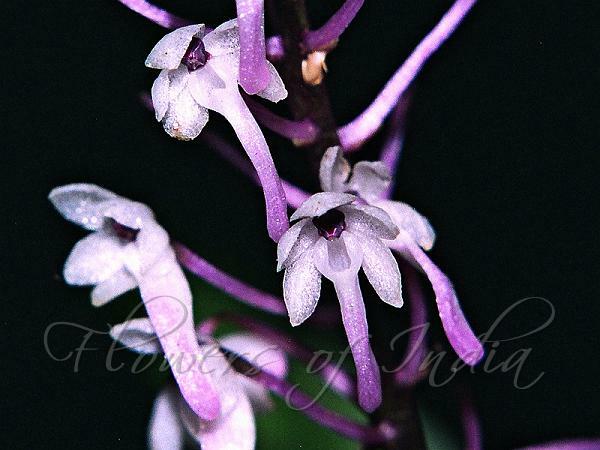 Flowers are white, tinged with purple, borne in about 5 cm long lax raceme, in leaf axil. Bracts are 2 x 1 mm, ovate, tapering, 1-veined; sepals 3 x 2 mm, obovate, pointed, 1-veined; sepals and petals gland dotted; lip 7 x 2.5 mm, obscurely 3-lobed with a prominent spur; side lobes insignificant; midlobe triangular. 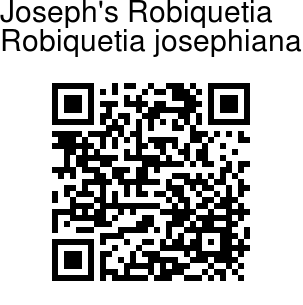 Joseph's Robiquetia is endemic to Peninsular India. Flowering: October-November. Identification credit: P.S. Sivaprasad Photographed in Anamalai Hills, Tamil Nadu.